Despite that the ragdoll semi-long coat looks like it needs alot of work, it is very simple to groom. The big difference with for example a persian who's coat needs daily maintenance, the ragdoll coat doesn't have the tendancy to tangle and because of that it doesn't need as much maintenance. Most ragdolls will maintain their own coat, but sometimes u can come across an occasional tangle underneed the armpits, these are mostly fairly easy to remove. The ragdolls has very few to no undercoat, yet there are expections who do have an undercoat. These ragdolls need a little bit more maintenance than their undercoat free kind. It is ideal to brush your ragdoll at least 1 time a week, this way u remove loose hairs and u prevent hairballs. Ragdolls are in principle a healthy race, for wich are no special concerns about their health. There are however lines wich have kidney or heart problems like HCM and PKD or CIN. Breeders should test for HCM via dna and echo, and for PKD and CIN via echo since there are no dna test available for the ragdoll. 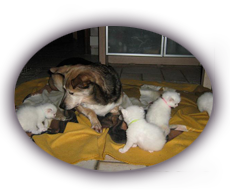 It is advisable to do these echo's every year with breeder males and females. It is also advisable to make sure that your ragdoll gets his or her yearly shots. 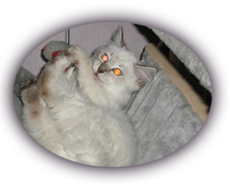 It is best to buy your ragdoll with a responsible breeder that can give u healthguarantees. The cat is by nature a meat eater, it is very important that u provide them in their needs. The best thing is that u feed your cat raw meat. Raw meat for cats are available at specialized stores. U can use premade raw meat (frozen), me i feed my cats Tinlo. Or u can make your cat's own menu. But since feeding raw meat isn't possible for everyone there are enough good alternatives with dry food. Dry food that u can buy in the supermarket aren't a good choice. This food is full of grains and it doesn't have enough meat in it. In pet stores u can find alot of different kinds of reasonable quality food, these still have grains in it and still not enough meat. The best for your cat is that u buy a grain free food with at least 65% meat in it. We feed Orijen(contains 80% meat of fish) and Acana(65% meat or fish). It is also important that ur cat drinks enough. This can be stimulated by a pet waterfountain.